Muslim people are so low they don’t even belong on this earth. Not only they are attacking people from other nations but they are doing terrible things even to the people who support them! 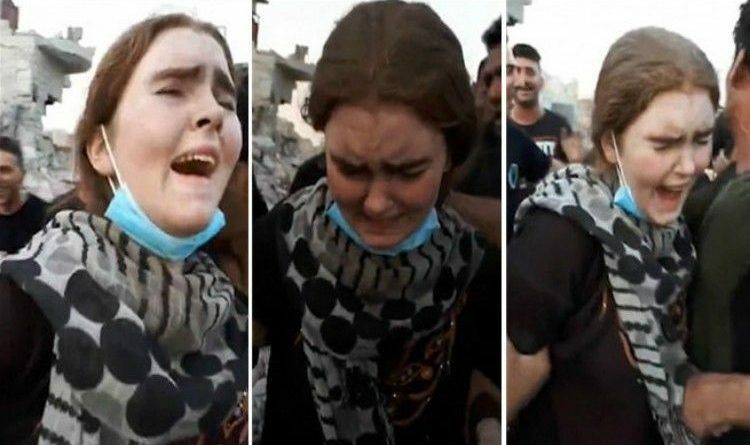 Runaway German schoolgirl, Linda Wenzel (16), now faces execution for joining ISIS as the video reveals the moment she was captured by baying soldiers in Mosul! The 16-year-old Jihadi bride was filmed by an Iraqi soldier when she was dragged, filthy, dazed and wounded in her arm, from the Islamic State stronghold that took nine months to capture. That video was aired on the German newspaper Bild’s website for the first time today. Linda, who converted to Islam as a 15-year-old schoolgirl in her hometown of Pulsnitz in eastern Germany last year, ran away from home to join the fanatics after being groomed online by an Isis recruiter. She flew to Istanbul, was smuggled into Iraq, marred a Chechen fighter who was killed and ended up in Mosul where an estimated 25,000 Isis volunteers died in the battle to retake the city. In the video, two men can be seen escorting Wenzel, who seems to wince in pain from a wound. She looks at the ground and cries miserably as she is led away. According to local reports, she was dubbed the Belle of Mosul by soldiers during what was described as a ‘walk of shame’ to a make-shift prison. She knew what she was doing, she didn’t feel bad when she was committing those horrible acts and hurting all those people. Why does she expect people to feel sorry for her for what she did? Merkel is and was the problem. Her belief system, her sick mind. She hates Germany just as Obama hated America. Major liar to the German people. We got rid of our traitor it’s time for Germany and Europe to do the same!